Roll grinding is a specialized form of cylindrical grinding and precision grinding of various kinds of rolls. Roll grinding wheels are used in the re-grinding and production grinding of rolls for the Steel. Brass, Copper, Aluminium, Printing Paper and textile industries. 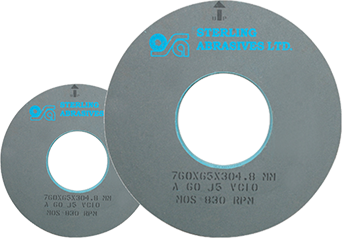 Sterling’s Roll Grinding wheels give excellent finish and are used in grinding work rolls and back-up rolls used In Hot Mills, Cold Mills, Sendzimer Mills, Aluminium Mill, Grinding chrome plated rolls and rubber rolls. Suitable for machines like Churchill, Hercules, Siegen, Bhiman, Meska, Vikas etc.